I recently had my first Hibachi restaurant experience. I had no idea what I was missing. I loved everything about it – but I especially loved the noodles. They were sweet and spicy and I devoured my whole portion entirely way too fast. I dreamed about them for a few weeks (hubby vetoed going back to the restaurant so soon) before googling to see if I could find a recipe to make them at home. When I ran across this one, I couldn’t believe how easy it was. Seriously, if you can boil water, you can handle making these. They’re also rediculously quick – mine took about 10 minutes start to finish. We served these as a side with grilled steak and veggies. They also reheated well for lunch the next day. Whisk together the rest of the ingredients in a small bowl to make the sauce. Set aside. Heat a wok or large skillet over medium/high heat. Add half of the sauce, then the noodles, followed by the remaining noodles. Toss for 2 minutes, then transfer to a serving bowl. *Note: I’m not linking the blog here like I usually do because the last two times I visited the site, my antivirus flagged it as a site that was distributing viruses. If you’re interested in visiting the site anyway, you can find it by googling the name. WAAAAAAAY TOO sweet. If I make this again, will not use ANY sugar at all. 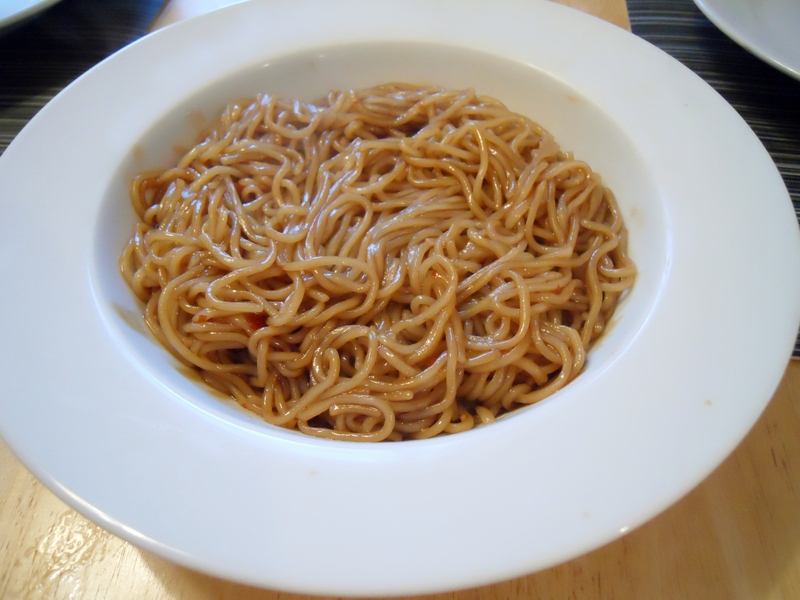 Are the noodles at your hibachi restaurant not sweet? These were a dead-ringer for the noodles they serve at our local hibachi restaurants. If you left out the sugar, it wouldn’t be hibachi-like! How large is the package of noodles? The noodles are my favorite part of hibachi so I wanted to double the recipe. Also, could you use teriyaki sauce instead of sugar/honey. The restaurant I usually go to has sweet noodles and it looked like a dark sauce they used so I assumed it was teriyaki. I buy Nasoya Noodles and they come in a 9 oz. package. I wouldn’t sub teriyaki for the sugar/honey. I don’t think it would be the same. This sauce comes out dark like the one at our local hibachi place. Love this recipe! I subbed sriracha and garlic powder for the chili garlic. I didn’t have sesame oil but canola held up just fine. I used a little less sugar and added a bit of water to help make it all soluble. Family loved it! We had it with some yum yum sauce on the side of orange ginger steak w/ broccoli & some fried rice. Delicious! Totally made it feel like a night out! Only it didn’t cost us a bunch of $. Thanks for sharing! I really enjoyed this recipe. I omitted the oyster sauce because I did not have any. I substituted sriracha sauce and a couple of pinches of minced garlic in place of the chilli garlic. I cut the sugar down to 5 T. I think next time I may try 4 T. I also added a few drops of rice vinegar for an extra flare. They were great and my family loved them!! Thanks for sharing. Can you leave out the spicy and still taste ok? My family won’t eat even the slightest of spicy flavors.